We have just returned from holiday at the Grand Palladium White Sand Resort in Riviera Maya, Mexico. If you want to read our thoughts on the place, including the food, check out our Tripadvisor Review. Most of the house wine included in the all-inclusive package was pretty average, especially the red, although one or two of the a la carte restuarants were OK. Anyway we were jet lagged and had a busy weekend, so we ate convenience food and take aways for a few days. 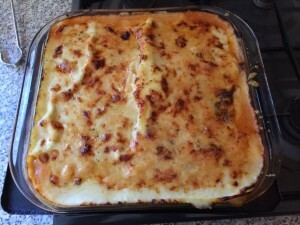 Tonight we had some Tesco Finest Lamb Moussaka, which we find reasonably tasty. 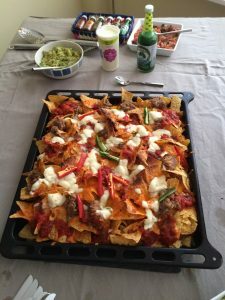 We last ate some on 4th Feb 2012 and paired it with an Aussie Shiraz. 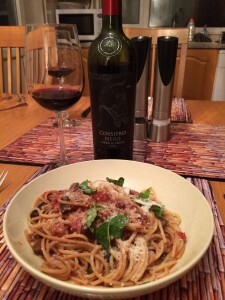 This time we opened a bottle of Casa Porta Carménère 2009 from Costco that we had enjoyed previously on 21 December 2011 with a Beef and Pork Chilli. We thought the wine was mellow with black cherries and plums and had a herby affinity. An acceptable match and nice to drink decent everyday wine again without having to pay a premium for it. 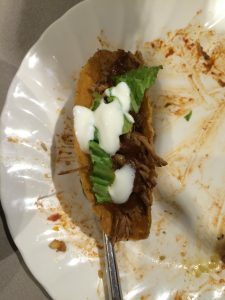 We found a recipe online called Pat’s Famous Beef and Pork Chilli from Foodnetwork.com. We reduced the huge quantities of chilli powder and omitted the black beans because we didn’t have any. We also substituted Foster’s Gold for the Budweiser in the recipe. 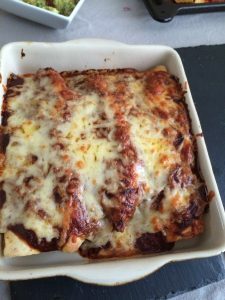 What a superb variation on Chilli Con Carne! 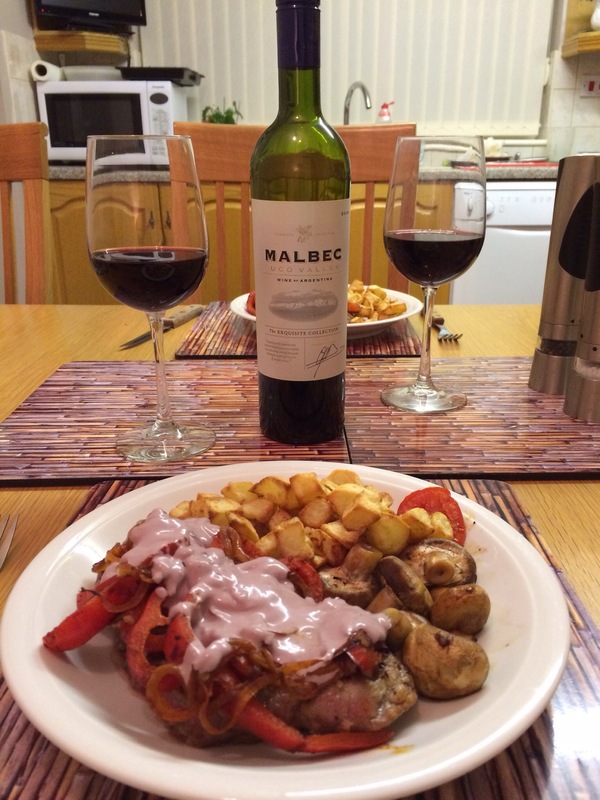 We accompanied it with a bottle of Porta Reserva Carménère 2009 a Chilean red from Costco. The wine had red and black fruits, plums, cassis, spiciness and smooth tannins. It was a good match with the Chilli. We’ve had a wine box on the go for casual quaffing. It’s Andes Rivers Chilean Carménère 2010 from Costco. This is a fairly lightish, easy-drinking red that is pleasant, but nothing to get too excited about. 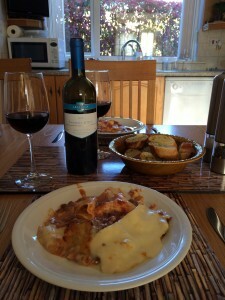 We had some Tesco’s Steak and Mushroom Pie for a quick midweek meal and poured a couple of glasses of the Carménère. Fruity and smooth with red berries. We thought this was quite a good match. 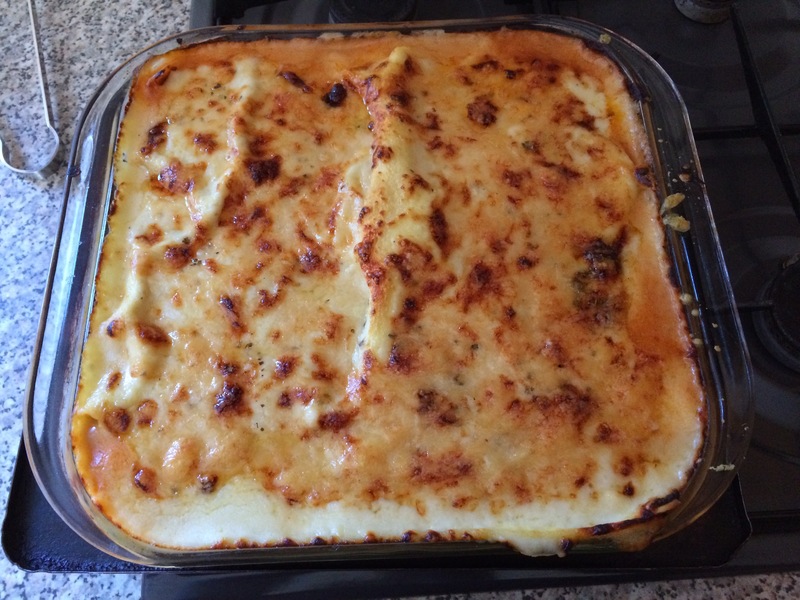 We had some friends round and Teresa did her favourite recipe – Bifteck Marchand de Vin. This beef stew in red wine contains mushrooms, thyme, tomatoes and shallots. Last time we ate this dish (see Wed 2nd Feb 2011) we had a bottle of Australian Cabernet/Merlot, which was a pleasant if not outstanding match. This time we opened two bottles – La Tour de Marrenon 2010 Reserve and Marques de Carano Gran Reserva 2004, both from Tesco. 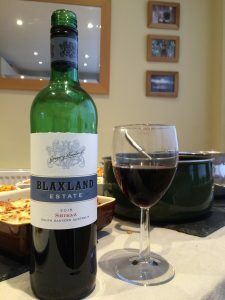 The first bottle was a Southern French red blend made from Grenache and Syrah with summer fruit flavours, which was pleasant enough, but it was juicy to the point of being a bit cloying. Easy drinking and OK with the stew, but something a little more complex would have been better. The second bottle was a Spanish red from Aragon and a blend of Garnacha and Tempranillo. This was a richer, weightier wine with cherry and raspberry fruit and some spice. A far better match with the stew. We had Escudilla de Cataluña (Catalan Soup) from Supercook, which contains vegetables beef stock and chorizo. 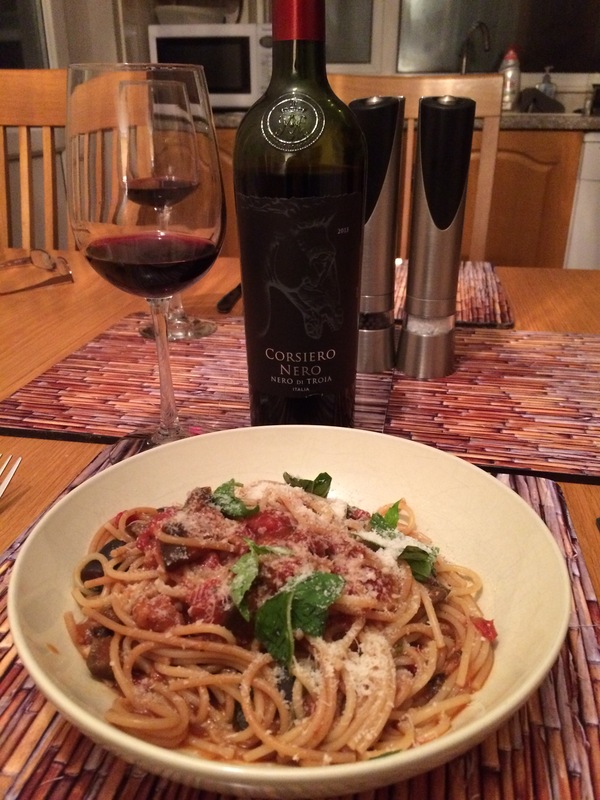 This was one of those meals that proved quite a challenge to find a decent wine match. We opened a bottle of Torre Ercilla Rioja Reserva 2006, a gift from some friends. From Sunday Times Wine Club, this is a smooth, oaky Spanish Red made from Tempranillo, with ripe red fruit. However, the dish did nothing for it, so we set it aside. We had a couple of unfinished opened bottles of wine, so firstly we tried some Rosemount Shiraz 2009 from Costco, but this too did not work. We then switched to white and tried some Namaqua Diamond Coast Chardonnay 2010 from Tesco. A better match, but still not particularly good, so we resorted to some wine box plonk from Costco – Geni Tempranillo. This, lighter, fruity, easy-drinking Spanish red actually worked quite well with the soup. 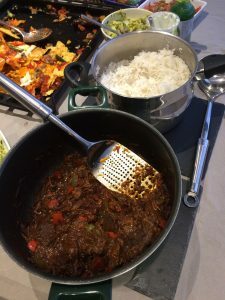 We enjoyed a Moghlai Lamb recipe from Madhur Jaffrey and fancied a red. Some wine and food buffs highly recommend a Chilean Carménère with Indian food and we have tried this pairing previously. We have rarely been disappointed. Apparently a key to its success is the inherently herbal nature of the grape. We opened a bottle of Don Cayetano Carménère 2009 from Sunday Times Wine Club and were pleased with the pairing. As well as the herbiness, this fruity wine had a spiciness which went well with the dish.